What is The Downtown Hanger Project? 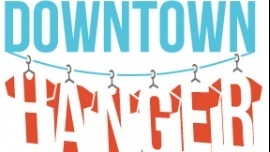 The Downtown Hanger Project is creating a apparel incubator to help local apparel brands, designers and artists to gain local brand awareness through a community driven retail boutique. A few months prior to starting this project, we formed a group called Hatch, with some co-workers to assist and hold each other accountable for EXECUTING our passions and ideas. While in the process of assisting Ryan in promoting his new brand, I realized nowhere offers the new brands a chance to showcase their line and designs but also a location to colloborate and discuss techniques, skills and marketing. While downtown at a Idea Mensch gathering. Ryan picked up a magazine with an article about The Downtown Project and Container Park. They were taking small business ideas via video submission and it would be fully funded if approved. Ryan urged me to submit the apparel incubator idea. After some web searches and brainstorming Ryan and I agreed that we wanted to prove the void in the market before submitting the video for funding. Nothing would be worse than getting approved and then finding out there wasn't a large enough community to support the project. We started with zero contacts and only resources we had were ourselves! We both have families with young children so we talked it over with the wives to give us 30 days to go all in. To do everything we possibly could with whatever available time we had outside of my full-time job and Ryan's 2 jobs. The reception by the community has been outstanding as The Downtown Hanger Project continues to snowball into a community in and of itself. What makes The Downtown Hanger Project so great? 1) Gives local design entreprenuers a chance to follow their passion with the assistance to gain local brand awarenesss through a high foot traffic location that gives the new brands legetimacy and grow their following. 2) We are making it community driven. The community will be the ones to select/vote on the brands and designs they like and wish to see showcased in our store. This would give the designers valuable market feedback as well as provide the following neccessary before they are put on our racks. 3) Creating a place where designers and artists collobarate in the back in a co-working environment with the resources to print and design the shirts on the spot. This also allows people in the store to meet with the designers who created the brands in the store. Where is The Downtown Hanger Project Based? We are seeking funding for a retail location inside the new Container Park in Downtown Las Vegas that will open in 2013. When was The Downtown Hanger Project founded? We started on November 1, 2012. We set out to prove a void in the market before submiting our video for funding. The Downtown Hanger Project was founded by Allen Soberano and Ryan Yoro. On November 1, 2012 we started without any contacts or recources in the design/arts community. We now have over 25+ local independent brands that we have brought together and the list continues to grow. Conducted 15+ interviews of designers and brands for the website to assist them in gaining local brand awareness with more lined up to be showcased. On December 16th we were GIVEN a booth at a YELP local holiday shopping event to prove our business model and the support of the community. We have been contacted by companies to hold Tshirt Design contests for their companies and fund raisers. V3Arts production volunteered to create and product our video submission for funding as well as including Downtown Hanger in a web series documetnary "I Am Downtown"
We connected Dustin Hoots, local artist with George Racz, founder of The Distillery while at the Yelp Spirit spree and now Dustin will be designing the new labels for their bottles. Multiple brands have gained an increase in sales from their interviews on our site. Multiple collaborations and collisions between artists and designers that give them both motivation and the resources to grow.